I am fascinated by older homes. When I see one in person from the outside, I wonder who lived there. What were they like? How many were in the family? What went on there? 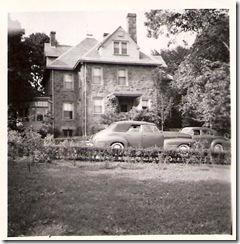 This estate is/was in Overbrook, Philadelphia. 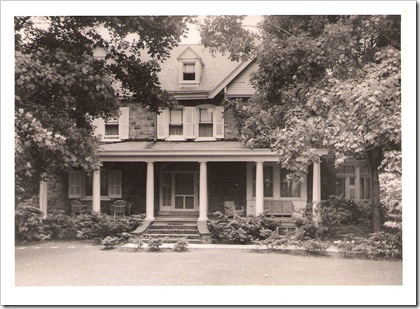 I don’t know if Overbrook was the name of the street or a section of town, but my mom’s Great Aunt and her husband (Estelle Klicker Scott and Carl Scott) owned this home for a long time. Carl was related to the Heinz family… you know, Heinz catsup? They were fairly well-to-do, and made a lot of their wealth during the Great Depression by buying up homes that were being foreclosed upon (yes, it happened back then, too!). They rented them out and eventually sold them for a much higher price. I don’t know when these pictures were taken, and I don’t know much about old cars, but probably someone can give me a rough estimate of the year based on the cars. While I never visited this home or met Carl, I know that Grandma Estelle liked nice things. In the photo of their living room you can see the beautiful furniture they had. 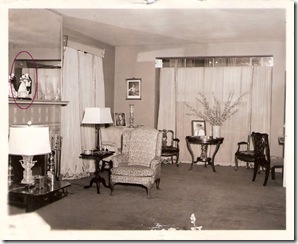 Carl’s photo is on the low table in front of the large picture window. Over the fireplace is a porcelain figure that I have circled for you to see. 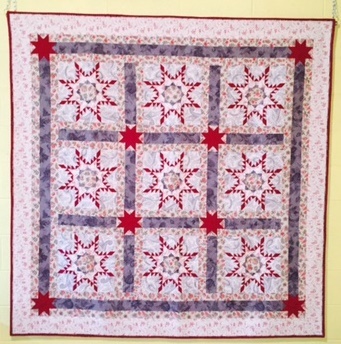 When Estelle died, it was given to my mom. It is now in my house. It’s not something I would have ever gone out and bought for myself, as I’m not really into things like this. But I’d never part with it. It reminds me of an earlier time in American history. It makes me think about family history and the way life used to be. I wonder what people will think of us 75 years from now? If you have knowledge of the Philadelphia area, I’d love to know more about this house and what exactly “Overbrook” refers to. Please contact me by commenting on this post or by emailing me at caronmosey at gmail dot com. I really enjoyed reading about this house! It’s such a beauty and certainly brings one back to another time and place. 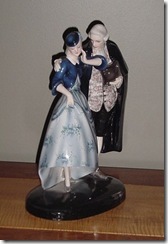 The figurine is lovely; what a wonderful keepsake to have inherited. I loved that first photo. Just imagine putting the baby in the carriage to have a nap on a summer day!I remember looking at a house years ago that was right out of the 30s or 40s, as it had been a summer house for years. I wanted everything that was in the house because it was so nostolgice.The Roosevelt cottage on Campebellow Island is like that.